Blade length : 71.0 cm or 27.95 inches. 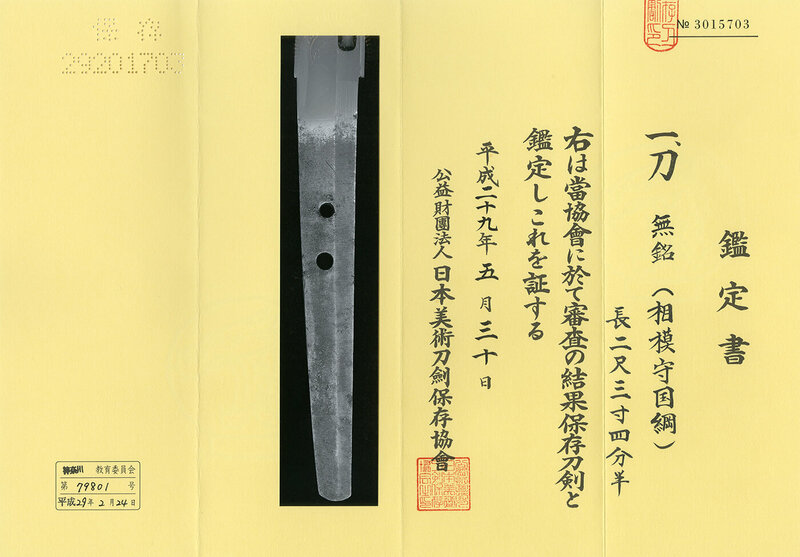 Width at the Kissaki : 2.23cm or 0.87 inches. Kasane : 0.715cm or 0.28 inches. Era : Edo period Keian era.1648. and thick with suitable sori and longer kissaki attractive shape. with sunagashi and kinsuji work. Special feature: NBTHK judged as Sagami Kami Kunitsuna . which streams of Echizen Shimosaka school with Yasutsugu. I think he learned a lot at that area. because of the square shape hamon. for Iai practice and also Kansyo blade(enjoy the jigane nad hamon).